Kootenay National Park (KNP) is a protected area of 1,406 square km, located south-west of Banff National Park and south-east of Yoho National Park. From glacier-clad mountain peaks to semi-arid grasslands of the Rocky Mountain Trench, where cactus grows, KNP is noted for its diversity of landscapes, ecology and climate. In 1858, Sir James Hector crossed the Vermilion Pass and noted that, in all his explorations, this was the best route for a wagon road over the Continental Divide. Hector’s route, the area now encompassing Kootenay National Park, has been used by First Nations people as a travel corridor to hunt bison on the plains east of the Rockies, for more than 10,000 years. KNP was established in 1920 as part of an agreement between the province of British Columbia and the federal government to build the Banff-Windermere Highway. The construction of this highway is an epic story. No massive road building equipment had yet been invented. Sheer hard work by men and horses was used to clear the forest and hack the highway from the stony mountainsides. Construction from the Columbia Valley began in 1911 but a lack of local funding and the onset of WWI brought work to a stop. By 1919, the “War to End Wars” was over, but the road was far from complete. 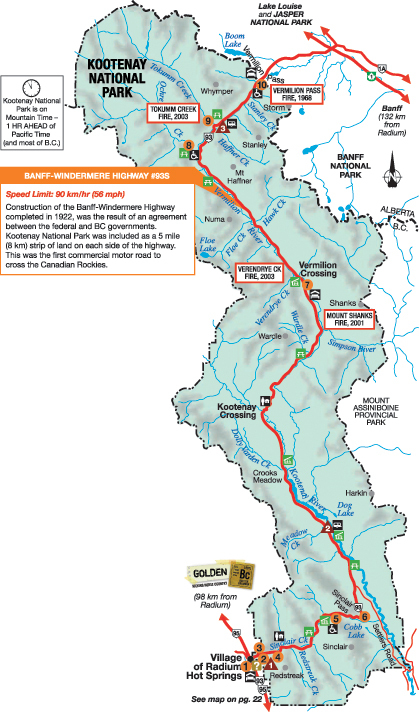 The Banff-Windermere Road Agreement stipulated that the federal government would build the highway in exchange for 8 km of land on either side of the road for the creation of Kootenay National ark. Travelling the newly completed 94 km Banff-Windermere highway, when it opened on June 23, 1923 was an experience. The trip from Banff took an entire day and travellers felt every bump in the road. Ktunaxa Nation culture & history exhibit. 1 km Trail with exhibit. Learn why grasslands and open forests are so important for wildlife. The iron-rich cliffs of the Redwall Fault provide a dramatic entrance to the park. 3 km From Radium; Admission fee. Locker, swimsuit and towel rentals. 13 km (15 min) from Radium. Interpretive trail bordering a clear, shallow lake. 16 km (20 min) from Radium. The Kootenay River Valley, The Mitchell & Vermilion Ranges. 63 km (45 min) from Radium. Gift Shop, Cabins & Dining. Lodge Open Mid-May to Mid-Sept.
85 km (1 hr) from Radium. Cold, iron-rich mineral springs bubble up through small pools, staining the earth a deep ochre. Main access closed for repair, access is via a trail from Marble Canyon, about 3.2 km north east from the Paint Pots. 88 km (1 hr) from Radium. Enjoy the sights and sounds of thundering glacial meltwater and the diverse vegetation resulting from the 2003 wild fire. 95 km (1.2 hr) from Radium. Elevation: 1640 m. The Continental Divide – the dividing line between the Pacific and Atlantic watersheds. A 15-min interpretive trail loops through a regenerating forest. Reconstruction began in 1947 and by 1952 the road was completed and paved. Today, travellers can complete the journey from Castle Junction on the Trans-Canada Highway (#1) to Radium Hot Springs in less than 90 minutes. Radium Hot Springs is located on the “warm side of the Canadian Rockies”, in the Windermere Valley. This small, visitor-friendly community is busy with activities, special events, and attractions. Whether it’s their championship golf courses, water sports on Lake Windermere, white water rafting, hiking, mountain biking, fishing, trail riding, mini-golf, shopping, or just relaxing in one of their many fine restaurants, you will find all you need to enjoy a fabulous holiday. Radium is a leisurely 3-hour drive from Calgary. Be sure to stop at the world famous Radium Hot Springs Mineral Pools, guaranteed to soak away your worries. The mighty Columbia River flows past the edge of town and it is bordered by the largest, continuous wetlands in North America. In May of each year, bird watchers from around the world enjoy the bird festival, “Wings Over The Rockies”. Radium Hot Springs is only a short drive from Panorama, Fairmont, and Kicking Horse Ski Resorts. Several very popular cross-country skiing trails are featured in the Columbia Valley. The mountains here boast some of the finest snowmobiling in the Rockies, with miles of groomed trails and many picturesque backcountry areas available for the enthusiast. 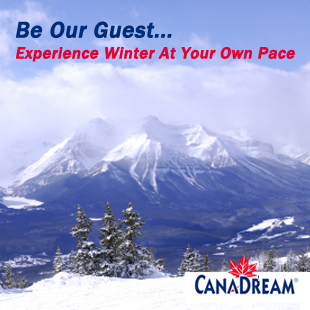 Come and experience Kootenay National Park, Radium Hot Springs, and the Columbia Valley.